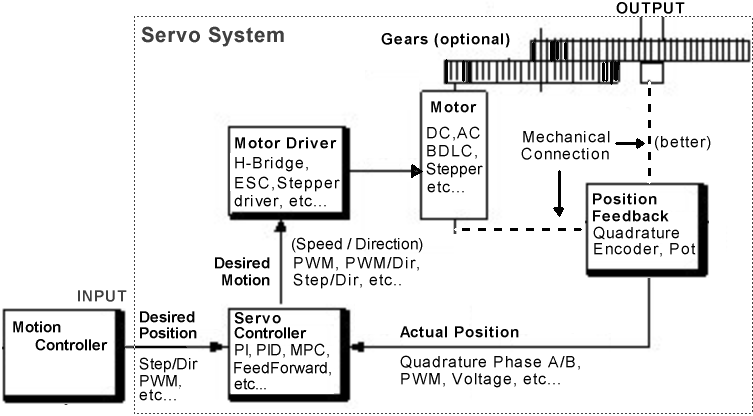 There are two classes of "Servo": "Hobby" or "RC" servos and industrial servos. Both are actually systems, including a motor of some type, with a built in position sensor and control system to move the shaft to the position request from some sort of data input. RC Servos change position based on the duration of the positive part of the pulse received. The pulse can generally range from 1 to 2 milli-seconds with center at 1.5ms. If the pulse is 1.5ms, the servo will be centered. At 2.0ms, the servo will rotate 90' clockwise. At 1.0ms, it will be at -90' or 90' CCW. The frequency of the pulses is less critical, and most servos will function from 40 to 200Hz. The position feedback is generally (rare exceptions) a potentiometer attached to the shaft. Accuracy is typically no better than a degree or two. The control system is generally an analog electronic circuit which compares the input pulse duty cycle with the duty cycle of another pulse developed from the internal pot and then moves the motor based on the difference. E.g. it is Proportional only. Industrial servos can be commanded to move with a wide range of input data including step/direction, PWM, serial ASCII data, and so on. They typically use optical or magnetic Quadrature Encoders to measure position, a control system which includes PI or PID control (like the BOB PID) and a driver to move the motor. Driver: The motor driver needs to match the motor: e.g. for a stepper motor you need a stepper motor driver. Position Feedback Encoder: Best connected to the actual output shaft, instead of the motor shaft, because then the system can compensate for slop in the gearing. When there is backlash between the output shaft and the motor shaft (caused by the gearing) 2 encoders can be used. This is also applicable to systems with a rotary encoder on the motor and a linear encoder on an axis. In this case, the PID loop may struggle with the backlash using only the motor shaft encoder. The two encoders may be combined by using the motor encoder for the P and D terms and the output or axis encoder for the I term^. Another possibility is to use two PID loops, one inside and one outside. https://sites.google.com/a/gluemotor.com/www/how-to-make Connecting a PC or SmartPhone audio headphone jack to a pair of servos requires no more than an 0.1uF decoupling capacitor in line from each stereo channel to the servo PWM input. http://openservo.com/ Servo control with the Atmel AVR embedded controller -- the OpenServo board goes *inside* the servo case, converting it from a "analog" servo to a "digital" servo. In addition to accepting position commands, it also accepts speed and cubic motion curve commands, and also sends back motor current and other information. Open source. http://www.electronic-testbench.com/lib/motors.htm Ton of organized excellent links to motor/driving info of all types. kyanpuSPAM at singnet.com.sg asks: " camp ask : i need help on how to pulse the servo motor directly using one of the outpin of portb, without the use of TMR2 PWM technique. " Can anyone point me to information on how to take servo pulses from an R/C receiver (RX Unit) and convert those pulses to an integer form? I would like to make sort of a two channel mixing unit for my airplane. I'd take two servo pulses, convert them into integers, do some calculations on them, then convert them back into PWM for the servos. Thanks in advance!